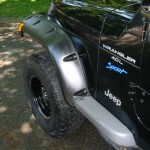 FAQ: How do I fix my faded Jeep fender flares? 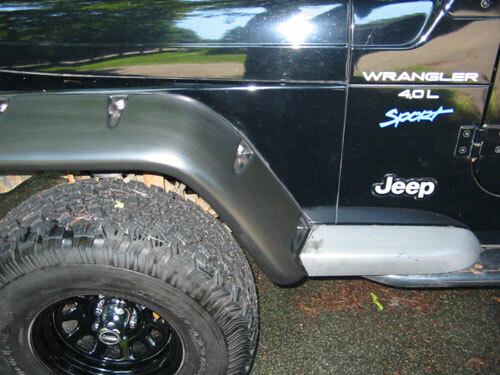 If you own a Jeep Wrangler for a couple of years, you’re bound to confront the problem of faded fender flares. They start out a nice shiny black and gradually fade to a crappy dull gray after a year or two in the sun. Products like Armor All or 303 will keep your flares shiny and black for a while, but one good rain will kill that pretty quickly. Another option is painting your flares, which unfortunately requires a lot of work and can be scraped/scratched off on the trails. So, what else can you try? Penetrol. 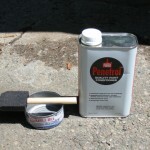 Penetrol is actually a “paint conditioner” thats primary purpose is to make oil-based paints spread easier. However, Penetrol also does a great job at reviving tired fender flares and restoring old fiberglass. Penetrol isn’t a “permanent” fix, but it lasts much longer than Armor All, 303, etc….your flares stay black even after a few rain storms. Buy Penetrol: pretty obvious start. You should be able to buy Penetrol at most hardware stores that have a good paint department. I actually found a can of it at Home Depot, but I had to ask around and dig for it. Penetrol costs about $10 per quart (a quart of this stuff goes a long way). Mask off painted areas: Penetrol is a strong-odored, combustible product. I was a little uneasy about getting it on my paint so I taped off small areas where I thought things could get sloppy. This was just a precaution on my part since the product isn’t specifically designed for automotive applications. Brush on Penetrol: as you can see from the pics below, I used a foam brush and an old tuna can (keepin it real) to apply the Penetrol. The foam brush made it easy to control the amount of Penetrol being applied…you don’t want it dripping off all over the place. It doesn’t take much product to coat the flares. Wipe flares w/ cloth: after you “paint” the flares, you need to lightly wipe them down. An old t-shirt seemed to work well for me. Penetrol has an oily consistency, so wiping it down leaves a nice clean finish. Disclaimer: I’ve used Penetrol on stock flares as well as Bushwacker fender flares (pictured below) and it has worked very well. I’ve never seen any damage to the plastic. However, I can’t confirm that Penetrol is safe for ALL flares or all plastic pieces…if in doubt, test a small amount of Penetrol in a hidden location (ie. underside of flare) before covering your whole Jeep with it. Good luck. Another method that has worked for me on faded bumpers and fenders (as well as on the white stress marks from trail damage), is to VERY carefully pass the flame from a propane torch across the fender or bumper. Quickly restores that new black look. @Tuber Yeah, I’ve heard of that method before, but w/ my luck I’d probably end up setting my rig on fire. OK at pismo beach 2009 wrangler hit fence protecting vegetation at pismo beach dunes (no jokes) bent drivers side fender flare up a litle (big crease) and the back half ripped out flare mounts I can replace flare mounts but do you think I can heat up the flare and bring it back? I’ve done the heat thing using a standard heat gun and it works great. Another method that I do often is to hit them with a pressure washer, getting them clean, then using Forever Black (you can get it at Quadratec). The best thing to do is put some sort of protectant on every 2-3 months. A friend of mine showed me the torch idea. After looking at his and approving the appearance, we torched mine. However you need to have a steady hand because if not they will get splochy. In the end I took the flares off, sanded with 120 grit, then wet sanded with a really fine grit paper. A good thick coat of flat black paint looks really good for almost 3 years now. This remedy will work on bumper caps for the xj? Im guessing so, but assumptons lead to mistakes. I’ve never tried this on XJ bumper caps specifically, but if they’re plastic it “should” work ok. However, I always recommend testing a small amount on a hidden area (before doing the whole thing) just in case. Good luck! 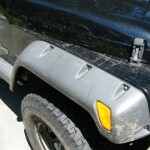 How to fix faded Jeep fender flares | Jeep Reviews.com Very nice post. I just stumbled upon your blog and wanted to say that I’ve truly enjoyed surfing around your blog posts. After all I’ll be subscribing to your rss feed and I hope you write again very soon! Garrett: Thanks for the post with the before and after pics. Very helpful. I found the Penetrol at Lowes and read that it was a ‘paint additive.’ The salesman, who seemed to know a lot about paints, told me it wouldn’t work after I infomed him why I wanted it. He said it is designed to both thin and add to paints; not a restoring product. Of course, if he hasn’t tried it, then how could he know? 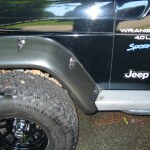 I have heard of using Penetrol to restore gray bumpers and side rails, but does it work on Jeep Grand Cherokee Laredos? Mine is a 1999 garage-kept by the previous, original owner, so the paint is in great shape, but the bumpers and side rails are faded. I used an Armour All product that worked nicely on the all areas but soon wore off after several hard rains and about 2 months. It would be great to have the bumpers and side rails look new as the paint job! Please advise. Unfortunately, I can’t speak for Grand Cherokees as I’ve only tested it on my Wrangler. And, my testing was done on aftermarket Bushwacker flares (which it has worked well on). My advice would be to try and test it on a small, “hidden” area and see how the surface reacts. Maybe you could try the underside of the bumper plastic or something and see how it goes. FYI, the Penetrol definitely wears offs over time, but it lasts MUCH longer than ArmorAll, 303, etc. (in my experience). Longevity will depend upon how much rain (or washing) your Jeep goes through. Best of luck! Saw Penetrol used on flares and SOFT TOP. Looked good but is it a good idea on the soft top? Any experience with it used that way? Tried the torch method, works just fine. Took about 10 min. for all 4 wheel flairs.I have a pretty large tip for my propane torch. Looks pretty good.Now if it just lasts. I have used Meguiar’s Endurance tire gel and it works pretty also. You have to make sure you wipe it down with a cloth afterward. The torch method works, it made my flares look like brand new! 2003 wrangler brought back the newness! unbelieveable! best trick I’ve ever learned off the internet! i tried the heat gun method on the flares of 1997 Wrangler and it left them with light blotches resembling gray camo. Any Ideas how to fix? Would propane even the color out? Previous post: FAQ: Should I Lift My Jeep? Next post: Jeep Recalls 288,000 Jeep Wranglers. Is yours one of them?